Nortel came from two goals down to claim a 4-2 win over Ardglass in the Amateur League’s Premier Division. 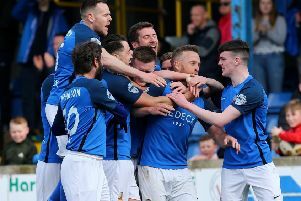 The County Down men were in the driving seat on Thursday evening, netting twice in the space of four minutes midway through the first half before Chris Monteith pulled one back with a 35th-minute header. Lee McCartney’s side found another gear after the interval firing home three without reply. Jordan Clarke set them on their way to all three points when he grabbed an equaliser on the hour and Adam Irwin gave Nortel the lead for the first time with a long-range effort. Phil McCann put the icing on the cake with a well-taken strike five minutes from time. UUJ secured their Division 1B status with a comfortable 4-1 win over Portaferry at the Factory Grounds. Grant Gardiner landed a double for the students while Patrick O’Donnell and Mark Craig, playing in his final game, scored the others. Down at the Diamond, Rathfern Rangers slipped to a 5-2 defeat to Colin Valley. The result sent Rangers second-bottom. Rathfern travel to Donard Hospital in their final game of the campaign this weekend.